Many Stephen Brown contemporary paintings exhibited at Red Rag Art Gallery are of British scenes which Stephen has been attracted to whilst travelling. His preferred British locations are areas in Devon, Wiltshire and Gloucestershire. 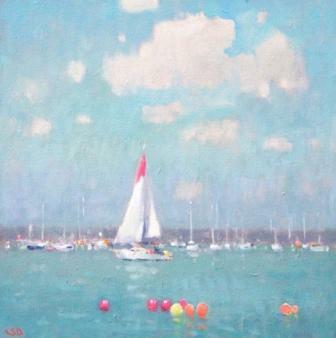 Big, expansive skies with interesting and unusual light are familiar features in his Landscape and Marine paintings. For each contemporary painting Stephen initially draws or paints on a small board taking photographs and detail notes at each location. The paintings are them completed in Brown''s Devon art studio. This particular Stephen Brown contemporary Marine painting " May Morning Salcombe - is a classic British Marine painting. Brown''s art mastery in depicting warm British Summer Days on the Devon coast has been put to good effect in May Morning Salcombe. The painting of the South Hams, Devon town has a peaceful and timeless quality to it. And Stephen has captured the light and calmness of the early morning sea perfectly. Another great example of Contemporary British Art from Stephen Brown - one of the UK''s leading artists. Click here to view more contemporary paintings by Stephen BROWN RBA.